In a world of smart phones and smart cars, the Internet is no longer limited to your desktop; it follows you wherever you go. And as long as you are online, you could potentially be tracked at all times. 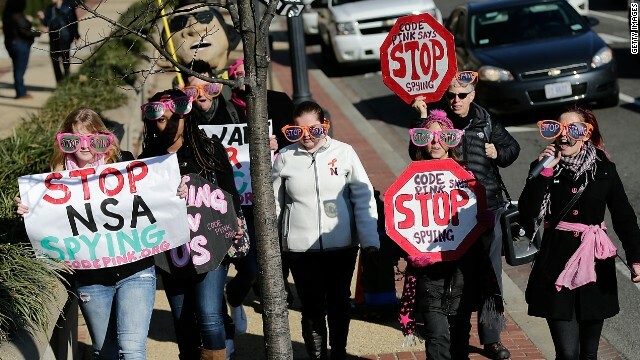 While all eyes are on the National Security Agency's bulk collection of data, a thriving economy built on mass consumer surveillance is growing. Companies are collecting information about consumers in order to sell ads more effectively. 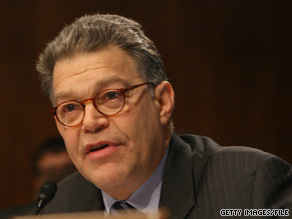 (CNN) – Sen. Al Franken, whose previous career was as a comedian and writer, has established himself as a serious lawmaker on Capitol Hill. But facing a potentially tough re-election fight in 2014, the Minnesota Democrat is enlisting a colleague from his former life to pitch in on raising campaign cash. (CNN) - They wrangle over nearly everything else, but members of Congress from both parties have found agreement on one topic: Olympic wrestling. 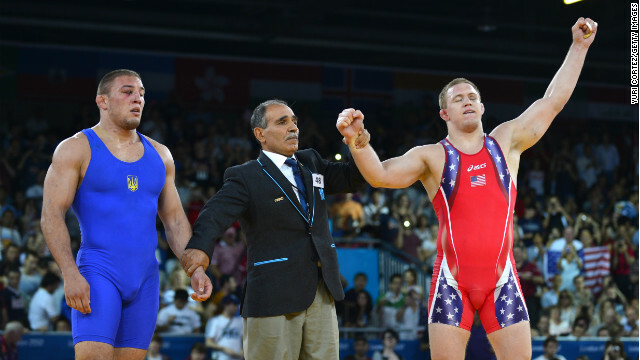 Senators and representatives from both parties stood in agreement Friday against the International Olympic Committee's decision to take wrestling to the mat, eliminating the sport from the games starting in 2020. They introduced resolutions urging the IOC to reinstate it and called on the United States Olympic Committee to "work actively to reverse this decision." (CNN) - Al Franken spent decades at the intersection of comedy and politics, so it's no surprise that his latest campaign fundraising pitch combines the two. "Hello, I'm Woman Picking Out Fruit In Supermarket," opened a fundraising pitch sent to supporters on Friday. 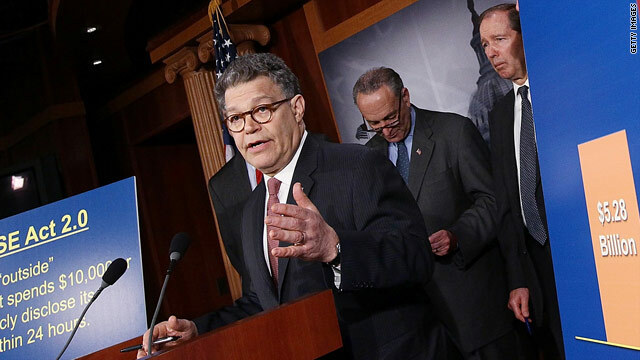 Washington (CNN) – Democratic Sen. Al Franken, Minnesota, fired off a letter to Apple CEO Steve Jobs late Wednesday demanding to know why the company's iPhones and iPads are reportedly compiling secret data tracking customers' whereabouts when they use or carry their devices. A self-described hacker and a former Apple employee say they recently discovered secret lines of code in Apple's latest operating system known as IOS-4 and, in an article released Wednesday, say it contains data showing consumers' whereabouts every time they use or even just carry a web enabled iPhone or iPad. Police are looking into damage to Al Franken's home. (CNN) – A window in Sen. Al Franken's Minneapolis residence was damaged by what could have been a pellet or BB fired from a gun, according to the Minneapolis Police Department. Sgt. Bill Palmer of the Minneapolis Police Department told CNN that members of the Franken family recently reported finding a hole in a window of their Minneapolis condominium that appeared to be made by either a BB gun or small rock. The hole damaged a double-paned window, but did not penetrate the second pane, Palmer also said. 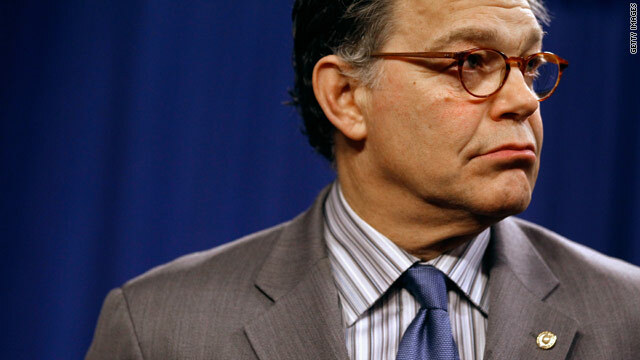 (CNN) - Sen. Al Franken apologized Thursday after Senate Republican Leader Mitch McConnell complained he mocked him while the latter was delivering a speech opposing Supreme Court nominee Elena Kagan. Franken, a Minnesota Democrat, was presiding over the Senate at the time of the speech, a McConnell aide confirmed to CNN. "This isn't 'Saturday Night Live,' Al," McConnell warned the former star of the comedy program moments later, according to the McConnell aide who asked not to be identified. 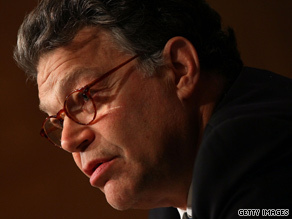 Franken was clearly moved by the confrontation, which occurred in the Senate chamber. 'I know progressives are frustrated...because it feels at times not everyone in our party is pushing at the same pace,' Democratic Sen. Franken said Saturday night at the annual Netroots Nation convention. 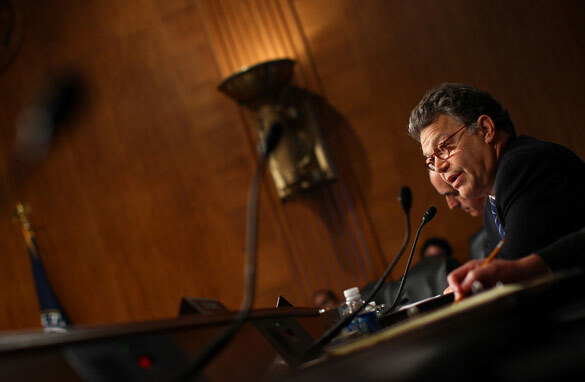 Las Vegas, Nevada (CNN) - Using some of his trademark humor and dire predictions, Minnesota Sen. Al Franken implored thousands of his fellow progressive activists Saturday to redouble their efforts to prevent the Democrats from losing control of Congress. 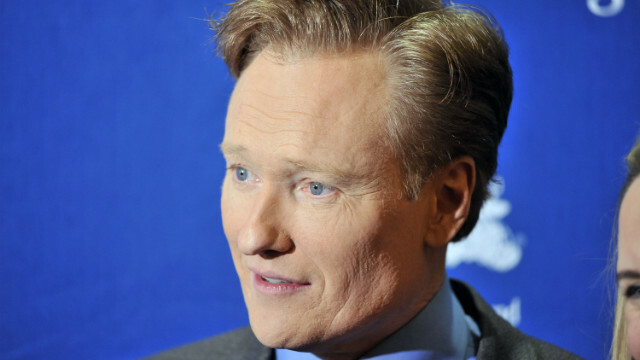 He jokingly called the Netroots Nation convention of bloggers, leaders and others "the most exciting political gathering of the year without guns." On a serious note, he said, he shared many of the frustrations of those in the audience about a lack of progress on some of their key priorities. "You really haven't gotten your moneys' worth," he said, specifically mentioning such ideas as a public option government-run health care plan or education reform or public financing of elections. "I know progressives are frustrated...because it feels at times not everyone in our party is pushing at the same pace," he said. He told them, however, that several of the bills that have been passed in this Congress - such as the health care overhaul or Wall Street reform - have helped the nation and were stronger because of their efforts. 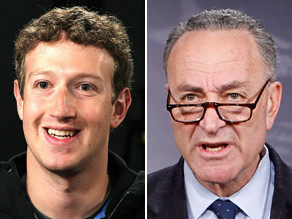 Sen. Chuck Schumer, D-New York, sent a letter to Facebook CEO Mark Zuckerberg asking him to change the social networking website’s privacy settings. Washington (CNN) – Senate Judiciary Committee staffers met Wednesday with two Facebook executives to discuss the social networking site's controversial decision to allow third-party sharing of users' information. "While he appreciates the tremendous value Facebook and other social networking sites provide to their users, the senator feels strongly that these sites should establish an opt-in policy for sharing users private data with third party companies and the default setting should always be more restrictive, not less," Brian Fallon, a Schumer spokesman, said in a statement to CNN. The Judiciary staffers work for Schumer, a member of the committee. Andrew Noyes, a Facebook spokesperson who participated in the meeting via telephone, sought to emphasize the common ground between the senators and Facebook. "We share the goal of user trust, the importance of innovation on the Internet, and how innovation can create better experiences for users," he said. "We talked about the success of the personalization announcements we made last week and the measurable benefits users and our Web partners have experienced. At the same time, we recognize that some users have concerns and we discussed ways to address them."